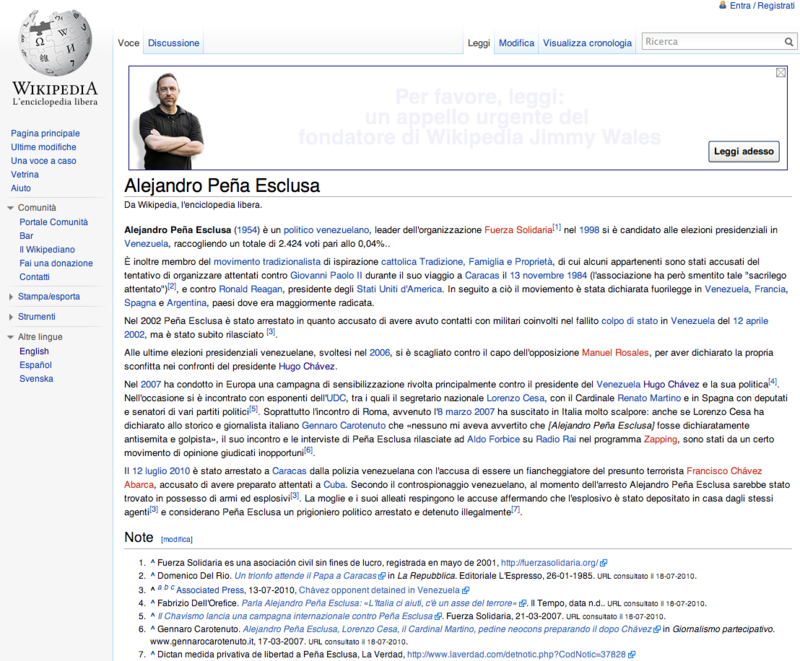 As I reported in July 2010, Italian Wikipedia contains libelous claims about Alejandro Peña Esclusa, who is a political prisoner in Hugo Chávez’ Venezuela, a country that from now is a Soviet-style communist dictatorship. Yet, as late as today Italian Wikipedia blocks every attempt to remove the slander, even though they have been given proof that it is a lie. The lie in question is that Mr. Peña Esclusa would be a member of an organization called Tradition, Family, and Property (TFP). Without citing any source for this claim, Wikipedia goes on to present a number of very serious allegations against TFP (not against Mr. Peña Esclusa). By doing this in the same paragraph they leave the non-expert reader with the impression that all of these things are the acts of Mr. Peña Esclusa, and that there is proof for it all. On numerous occasions this lie has been pointed out to Wikipedia, in no uncertain terms as is evidenced on the talk page. Yet, the only result is that the one pointing out this lie has been blocked, thereby silencing the criticism and the inconvenient truth. The pattern has been repeated over and over. The last attempt to remove the slander was made on New Years Eve. The paragraph in question was deleted with a reference to an explanation in the discussion page, in the form of a referenced quote from Alejandro Peña Esclusa’s book in which he, himself, states that he has never been a member of TFP. However, the deletion was undone within 3 minutes by another user, without any explanation on the talk page. 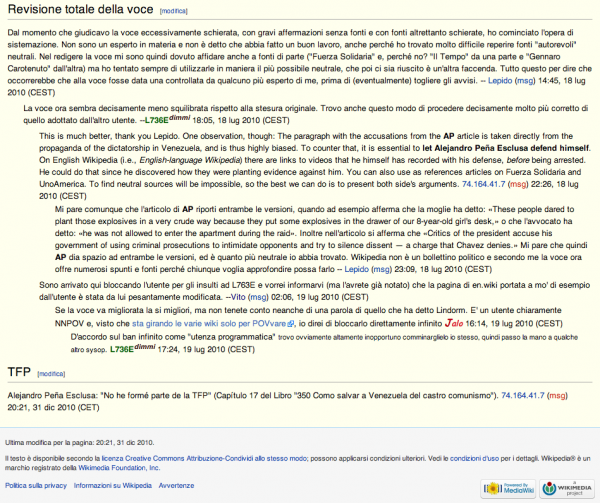 The user deleting the page again deleted the libelous claim, and two minutes later the Wikipedia editor Vituzzu not only reinserted the paragraph without explanation, but also blocked the user from editing both the article, and also the discussion page. Vituzzu thereby ensured that the blocked user can’t complain, or request that Wikipedia explains why they are helping a communist dictatorship incarcerate an innocent man, by helping them to spread their lies. For them to spread big lies is an integral part of their strategy to prevent Europeans from understanding the true nature of the narco-terrorist states led by Cuba. While Wikipedia will claim that they have no editors, the fact that Vituzzu has the power to block dissenting opinions from being heard makes him a “Wikipedia dictator”, and thus – in any reasonable interpretation of the word – an editor. It is irrelevant if and who pays him for the job he does in the service of the dictatorship. 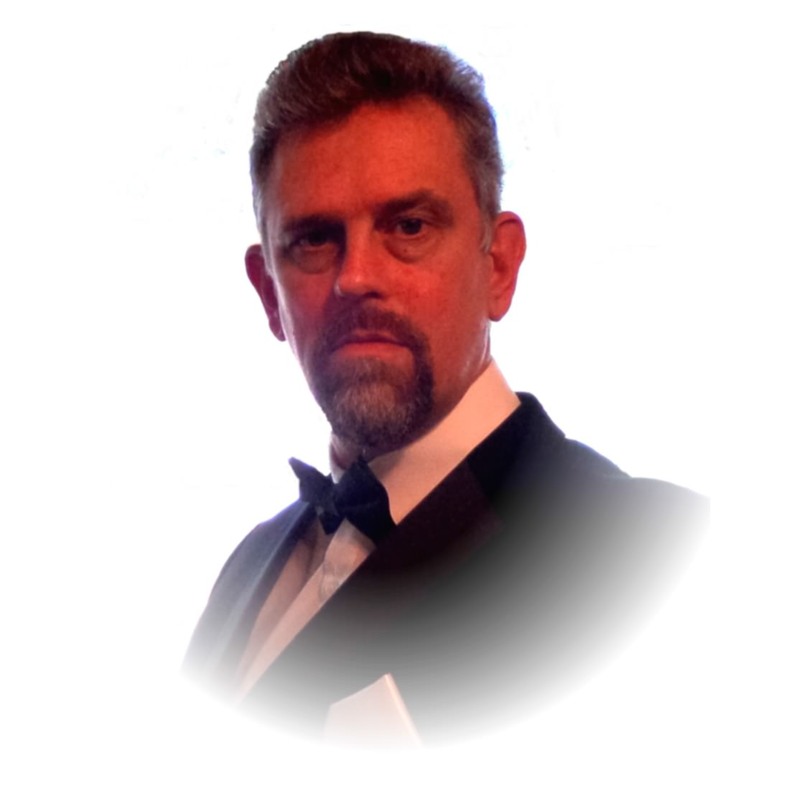 Wikipedia has given him the authority to act in their name by blocking other users, and consequently they are responsible for his acts. The most blatantly slanderous paragraph in this article is the one talking about TFP. That was the one deleted and re-inserted twice today. The quote from Alejandro Peña Esclusa's book was provided with a reference in the talk page, but ignored by Wikipedia's editor Vituzzu. The change history shows that any change that removes the slander is revoked within minutes, and that it has been like that for months if not years. This is the message that met the user after the second "undo". 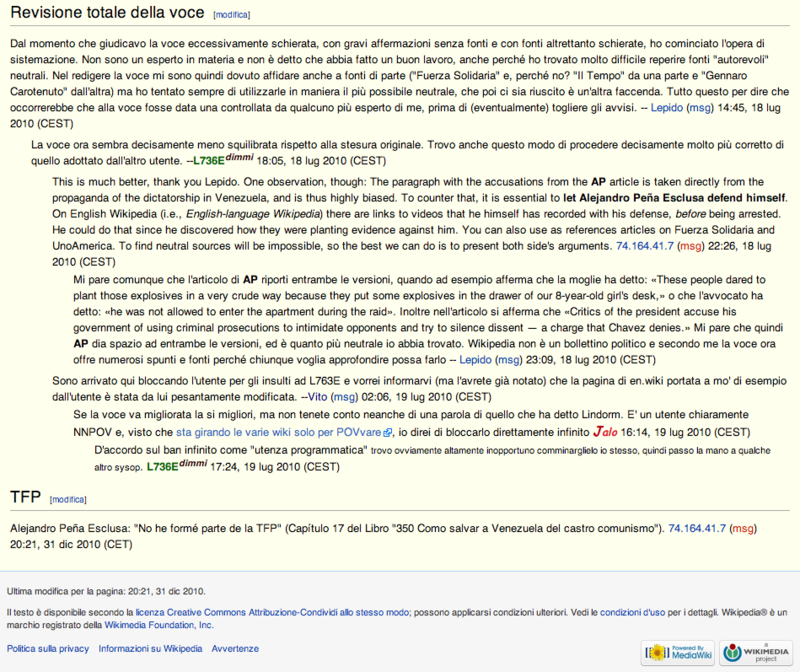 He is blocked from all pages in Italian Wikipedia which means that he cannot even point out the problem on the discussion page, or on Vituzzu's user page. The problem this creates for law enforcement is self-evident. A political prisoner in country A (Venezuela) is hurt in country B (Italy) and as a consequence also in the rest of the world, by material on a server that may be in country C, edited by persons who may be in any country in the world. They could even be the staffers of Hugo Chávez’ own ministry of propaganda, a powerful organization that also counts with the international satellite-TV network TeleSur, and which deploys all the methods and lies that communists have refined since the early Soviet Union. What responsibility does Wikipedia have? You can log in (click Further in bottom right) and leave comments. It is the dark before the dawn. The moon is vaning. 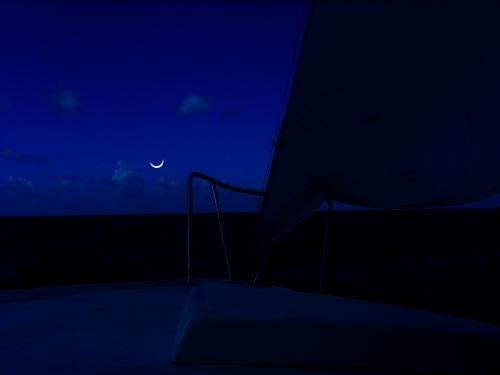 It disappears in the ocean in one end of the horizon, and emerges in the opposite, this moon-ship that sails over the night sky. It is never so still as in the eye of the hurricane. It is never so quiet as in the calm of the storm. When the screaming wind has lost its breath, when waiting in silence for it to return, not knowing when. But the sailors know that without them the ship is helpless. They know that the captain can do nothing by himself. They all risk their lives for the ship, because they are all in it together. Las lluvias comenzaron hace meses. Las inundaciones se han llevado 40 vidas. Pero sigue lloviendo en Venezuela. Las alertas de dictadura llevan muchos años. El golpe constitucional ya llegó. Pero la gente sigue sentada. ¿Hasta cuando lloverá en Venezuela? ¿Hasta cuando Dios llorará sobre Venezuela? El hombre propone y Dios dispone. Proverbios 16:1. This text was distributed on the internet this evening. It declares that a student organization with tens of thousands of members has been created in Venezuela, and that they do NOT recognize Hugo Rafael Chavez Frias as the legitimate president of Venezuela, vowing to remove him from office “at any cost”, through civil disobedience. La Central Estudiantil Universitaria (CEU), recién creada y que agrupa adecenas de miles de estudiantes de las universidades del país, acaba de declarar a Hugo Rafael Chávez Frías como enemigo público número uno del país. La CEU ha determinado que Chávez debe ser destituido de la Presidencia de la República por cualquier medio viable por haber entregado el país a los cubanos, traicionado la Constitución y pretender implantar una dictadura militar de extrema izquierda contra la voluntad popular. La organización universitaria llama a cada ciudadano del país a la oportuna y justa desobedicencia civil en las calles hasta la renuncia o destronamiento del tirano para salvar la democracia en el país. Añade que ya no tiene sentido desgastarse en pedir que retiren la habilitante ni el “paquetazo” de leyes cubanas que vienen detrás, pues el régimen no está dispuesto a considerarlo siquiera. Por ello insisten en que TODA LUCHA EN LAS CALLES DEBE ENFOCARSE EN EXIGIR LA RENUNCIA DEL DICTADOR PROCUBANO HUGO CHÁVEZ CUESTE LO QUE CUESTE. Le urge leer el blog “Milagros Socorro“, y especificamente “Siempre habrá una estrella“. Vale la pena. President Pepe Lobo is figuratively licking the boot of his country’s main enemies, and not just in words, but by trying to execute a self-coup, an autogolpe, by overstepping the separation of powers in the most perverse way. He is trying to illegally replace the Supreme Court. The president of Honduras, Porfirio “Pepe” Lobo Sosa, was elected in November 2009, after the previous elected president Manuel Zelaya had been deposed on June 28 for ignoring a binding verdict from the Supreme Court of Justice (CSJ). Powerful friends of Zelaya, who have an extraordinary influence over the global public opinion, made sure that his legal deposal got labeled a military coup in the minds of all who didn’t look under the surface. As a result Honduras interim president Micheletti was not recognized by any country. President Lobo has been recognized by perhaps a 100 countries by now, but not by a number of countries in Latin America, and they block the readmission to OAS. It is to achieve that readmission that Lobo now is taking actions that cannot be described as anything but boot-licking. The countries that don’t recognize Honduras are the ALBA countries, the allies of Chavez’ Venezuela, and Castro’s Cuba. The friend of Zelaya that I mentioned is non other than Hugo Chavez. He used his ministry of propaganda, which has an international satellite TV channel at its disposal in the form of TeleSUR, to create the global image of the event. They stage events and have “news actors” in the form of paid demonstrators who create scenes for the cameras, while at the same time other staffers, pretending to be demonstrators as well, use force to keep the other media from covering what they are doing. They go as far as firing firearms, and whether by accident or on purpose it seems that it was they who killed the 19-year old outside Tegucigalpa’s airport on July 5th, 2009. Their version of events is spread by many blogs that appear to represent grassroots in many countries, but which in reality most likely are all coordinated if not controlled from Havana, Cuba. Against this media super-power Honduras has not much more than a handful of bloggers. Maybe you think I wrote Cuba by mistake instead of Venezuela above. No, it was no mistake. You see, Hugo Chavez turns out to be surrounded by only Cubans, led by non other than Comandante Ramiro Valdez, who fought with Castro in the Cuban Revolution. With Chavez admiring Fidel Castro, he is effectively just a capataz, a farm foreman, for Castro. It is a fitting description also because Cuba is poor and Venezuela is the “farm” that feeds Cuba. Not at least with oil. Castro is also using his capataz Chavez to buy other countries in Latin America, by including them in the ALBA group (the “Bolivarian Revolution” alliance): Bolivia, Ecuador, Nicaragua, and some minor islands. Honduras joined under Zelaya but left again under Micheletti. When Lobo took office his very first act was to allow Zelaya to leave the country, in spite of there being pending court cases against him for very severe corruption. The ALBA countries refuse to recognize Lobo as president if he doesn’t remove those charges against Zelaya. Having constitutional separation of powers, neither the president nor the national Congress (CN) can interfere with the judiciary; nevertheless, they are trying as hard as they can. The word now is that they will vote in CN to fire the attorney general and all the justices of the CSJ – even though that, too, would appear to be unconstitutional. In essence, Lobo is licking the boot of his country’s enemies by trying to please those dictators while violating the oath he took to obey the Constitution. The word treason comes to mind. What will this lead to? Assume that they take the vote and it passes. The decision could of course be challenged in court, by those that are supposedly fired. At that point Lobo, who acts as the capataz of Honduras for Castro, could say that the CSJ is attacking the CN, even though it is the other way around. Who wins in the court of public opinion is a question of who has the most effective propaganda at his disposal. But who wins on the ground in Honduras is a question of whose orders the military chose to obey; the president’s, or those of the Supreme Court? Assuming that the president disobeys the court. But if he does, then he may be deposed legally the same way that Zelaya was. What Castro, Chavez, Zelaya, and Lobo are counting on is that if it fails the first time it will succeed the second. Honduras must braze itself. The attack directed from Havana, Cuba, aimed at introducing maffia-style narco-communism all over the Americas continues. Honduras has won one battle but the war rages on. So what to do? Attack is the best defense, they say. Instead of waiting for the wolf to attack again, seek him out and fight him where he lives. In other words, cooperate with the democratic opposition in the countries from where the wolf is attacking. Cuba is where the brain is, but what matters most is the money. Venezuela is the source of the money. Chavez’ has just made himself dictator by a Hitler-style coup. The vast majority are hostile to the Cuban model, yet that is what is being implemented by Chavez. 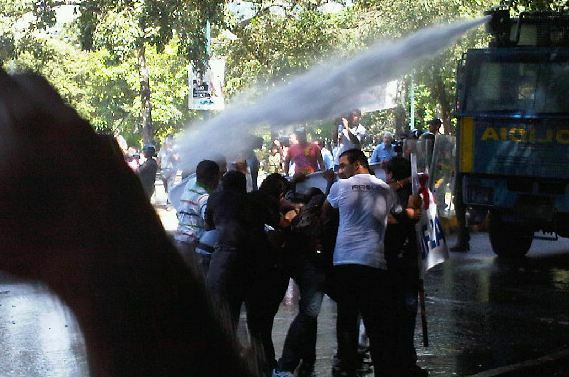 The repression of the opposition has started, but most dissidents are still not jailed. However, with the new censorship laws it is just a matter of time until free speech has been so suppressed that Cuban-style conditions take over, and effective opposition becomes impossible. The optimal time for a revolution against Chavez’ dictatorship is just now. Such an anti-Communist revolution in Venezuela would benefit all countries that are being threatened by the narco-communist plans that are being financed with the oil income that is being stolen from the people of Venezuela. This is why Hondurans would be wise to go online and help their brothers and sisters in Venezuela to spread the truth about their country internationally. It is essential as a balance to the regime propaganda. It would also give the judiciary in Honduras, and the military, and the opposition parliamentarians, fortitude in resisting the pressure from the dictator’s boot on their necks. En el centro neurálgico del poder el asunto está muy candente. Hay ya varias facciones. Los hay quienes (al estilo de Carrizalez) no pueden soportar más algunas cosas. Por un lado está el Presidente psicópata rodeado únicamente de los cubanos. Solo Jaua y el Min de Defensa pueden hablar con él, pero nunca a solas. Por otro lado está Diosdado que va por libre. Sabe demasiado y controla demasiado. El solito tiene más poder real que los cubanos. Y ya es mucho decir en estos momentos. La única manera de inclinar la balanza hacia el lado de Chávez y sus cubanos (ahora dirigidos personalmente por Valdez) sería la derogación de la Constitución y el desembarco de fuerzas cubanas en el país (escenario nada improbable, por cierto). Pero a unos cientos de millas náuticas al noreste y al norte, así como del lado occidental de nuestra frontera saben perfectamente cada movimiento que se hace. Si una sola unidad militar se mueve de Cuba a Caracas empieza la fiesta. Y Cuba lo sabe y Chávez también. Lo tienen muy difícil porque de querer Diosdado esto dura cinco minutos. Y tampoco pueden acabar con él porque su información ya está a buen recaudo (como la de Ramírez, por ejemplo) y su caída significaría la activación inmediata del 80% de la FAN (que de generales hacia abajo no están con todo esto). Si no nos doliera el alma de solo pensar que en estas horas se está jugando el futuro de nuestros hijos y de nuestra Patria; podríamos decir que el escenario (lo que ellos dan en llamar Teatro de Operaciones) está bastante interesante. Dos bloques dentro y un enorme bloque (más amorfo eso sí) fuera: ¡TODOS NOSOTROS! Todas las hipótesis acaban con Chávez fuera del poder e inclusive con serias probabilidades de desaparecer físicamente. Pero el gran problema para Cuba es que, o se lanza con todo en esta aventura, o sin la manutención venezolana no soportarían algo parecido a lo nuestro: la presión popular. Ya comienza a resquebrajarse la otrora inviolable seguridad cubana de inteligencia porque ya decía el viejo Caldera cuando dirigía aquel “chiripero”, ¿recuerdan? “Pueblo con hambre no piensa”… y Cuba lo sabe. ¿Y de este lado? ¿que tenemos? Muy poco amigos, lamentablemente. No ha podido salir ningún líder que aglutine porque sería una diana demasiado fácil para el régimen. Sin embargo sí comienza a calar en algunos grupos políticos hasta hace poco de imposible conciliación, la idea de que lo que viene es duro y que, o nos unimos o no habrá alternativa. Tanto la masa de la FAN como los elementos foráneos, no pueden ni deben actuar en estos momentos hasta que ellos den el primer paso. Si lo hacen Chávez recula y le habremos dado la excusa para presentarse como víctima. Es el pueblo el que tiene que salir y manifestarse, tal cual lo están haciendo (brillantemente por otra parte) los estudiantes de nuestro país. Les lanzan agua, perdigones, peinillazos; pero sus escaramuzas son excelentes. Nunca saben por donde les van a salir y eso es muy difícil de combatir. A todas estas, la debacle eléctrica está a punto de servirse. Y lo peor es que no hay posibilidades de solución, porque haría falta la enorme cantidad del dinero malgastado y, por otra parte, no hay tiempo para reparar el entuerto. Cuanto más encendido y retador vean al psicópata presidente, más débil está en realidad. Si por el fuera dejaba que los cubanos tomasen el mando, quedando el como mero elemento decorativo. Pero Cuba juega dos bazas y sabe que si esto acaba en conflicto ellos también pierden, y muchísimo. A Cuba le interesaría más que la cosa se calme y seguir mamando de la jugosa teta venezolana. Pero si se apaga la luz (y está a punto de apagarse) seguir igual es radicalmente imposible. Le quedan muy pocos actos a este interminable Sainete. Seremos testigos de excepción de todo lo que ocurra, pero debemos seguir de ocasionales actores, no solo de meros espectadores privilegiados en el Palco de Honor. AL REENVIAR, HAZLO CON COPIA OCULTA (tal como hice contigo) Y ELIMINA MI DIRECCION (asi como yo elimine la del remitente). PUEDEN COPIAR LA DIRECCION DE AAAA QUE APARECE EN: PARA Y UTILIZARLA. Carlos Andrés Pérez was president of Venezuela 1974-79 and 1989-93. During the second presidency he survived two attempts at military coups d’état, the first led by Hugo Chávez, the very same person who was last elected president in Venezuela. Pérez died by a heart attack in Miami at 14:30, December 25th, 2010. On this same day the anti-constitutional and anti-democratic laws recently signed by Chávez were published in the official newspaper and became the law of the land. Venezuelan democracy and Carlos Andrés Pérez died the same day. His second presidency was ended by impeachment. He was removed from office for misappropriation of some $60k from a presidential discretionary fund, but he always maintained that the money was used appropriately to support the electoral process in Nicaragua. Here is his last speech to the country. It is completely in character that the Chávez regime does not know how to behave civilized at a loss like this. His minister of popular propaganda, Andres Izarra (on twitter as @IzarraDeVerdad, with URL http://www.telesurtv.net), tweeted: “MIAMI: where terrorists, the corrupt, drug dealers, dictators, paramilitaries, mercenaries die… from all of this suffering region” (MIAMI: donde mueren los terroristas, los corruptos, narcos, los dictadores, los paracos, los mercenarios… de toda esta sufrida región). The total lack of tact and dignity on the part of the person responsible for information in the Chávez government is surely not lost on the Venezuelans. Nor is the significance of the coincidence with the day Jesus was born. Christ was the expected saviour, he was and is the symbol of hope, when he every year is mythically born again. Fransisco de Miranda declared Venezuela independent from Spain in 1811. His lemma was “Death to Tyranny and a Long Life for Liberty“. In the new year it will be 200 years since that declaration of independence. This reminds me of the bird Fenix, that was said to live for exactly 100 years, then lay an egg, and when the bird died the egg hatched and a new Fenix was born. So while democracy and liberty died today, tomorrow it may well be reborn. With peace and faith everything is possible; things aren’t always what they seem to be. For three days Venezuela will be in morning. If it was me, I would dress in black, go out on the street, and hold a silent minute. Or two. Or three. Or maybe hours instead of minutes. I would welcome company, as long as all was silent and peaceful. But I would bring a cell phone so that I discretely could record any human rights violations that might occur, and post it on Twitter. That I would do tomorrow and the day after as well. Pérez would always say that he wanted to be buried in Venezuela “after we regain democracy.” The word today was that he will be buried in Miami. The one who lives will see. A Totalitarian Christmas Gift: Merry Chavizm! Venezuelas’ Hugo Chávez gave his subjects a very special gift on the eve of Christmas: A full-blown totalitarian dictatorship. Just like Hitler’s Nazis blindly followed their leader, so did many in Venezuela wish each other Feliz Chavidad (Merry Chavizm) instead of Feliz Navidad (Merry Christmas). So many, in fact, that Chavidad was on the twitter popularity list in Venezuela. Here is a partial list of the Christmas “gifts” from the former military coupster, elected president turned dictator: An Enabling Law that enables Chávez to create laws on his own, turning the new parliament after New Years into an irrelevant talking club; a law that makes it illegal for parliament members to vote their conscience; a law intended to stop the last independent TV channel, Globovision; a wide-ranging Internet censorship law; and a law that removes the academic freedom from Universities by forcing them to teach communism and gives himself the ultimate power over them. He also sent tanks to confiscate private farms the week before Christmas, he fired some 800 to 1,200 staff in the Finance Ministry the day before Christmas, and violently beat down a peaceful student demonstration two days before Christmas. With the rule of law suspended since years in Venezuela (judge Maria Fiuni was arrested just before last Christmas for following the law), Venezuela is now a full-blown totalitarian state. All that remains is to round up the remaining dissidents. At the time of writing this, no country has as yet denounced this power-grab, an autogolpe that has no parallel since Adolf Hitler’s power grab in the Spring of 1933. Just like in Hitler’s case it has a veneer of constitutionality, but a closer examination shows that both are coups d’état that violate the constitution. The Organization of American States (OAS) is aware of the extreme gravity of the situation, but still hasn’t lifted a finger, although they are the only international organization that has the power to do something – even if it is just to send a commission. The UN cannot get involved in internal matters in the member states, unless invited, and it is unlikely Chávez will invite them. The foreign country that has most to lose in the short run is Honduras, whose readmission to OAS is blocked by Chávez and his ilk. However, in order not to make it more difficult to get readmitted they refrain from denouncing this new Hitler. The Lobo administration is basically licking the boots of the dictator. Hugo Chávez is now a totalitarian dictator. Nor has the European Union spoken up. Perhaps they are busy with Lukashenko’s dictatorial excesses in Belarus, and can’t keep track of more than one despot at a time. Or maybe it is just under their radar. However, the one person that I really would expect better from is the Pope. He grew up in Germany, he should be no stranger to the methods that Chávez is using, since they are a blue-copy of what Hitler did. Furthermore, to do this at the eve of Christmas is an insult of diabolic proportion to Christianity. We celebrate Christmas to remember the birth of Jesus Christ, who was received as a saviour for an oppressed people in a dictatorship. Christmas is about hope. By giving the Venezuelan people this blow on the eve of the holiday of hope, Chávez has given the middle finger to Christ himself. Getting global awareness is key for being able to restore democracy and liberty and the rule of law in Venezuela. Let the world know that Chávez has made a coup against the Constitution that he himself created. 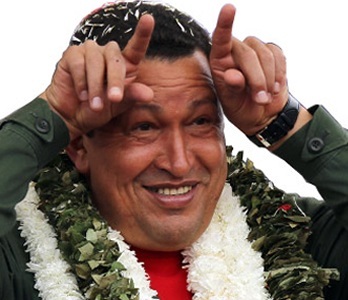 Ask every newspaper editor, church leader, and government to make a statement that Chávez has made a coup d’état. It is very important that they explicitly say that he has committed a coup d’état! BREAKING NEWS 12:08 ET: The Venezuelan General Carlos Peñaloza Zambrano has today publicly called for uprising against the “dictatorship”. It is the same general who published this guest blog here yesterday. 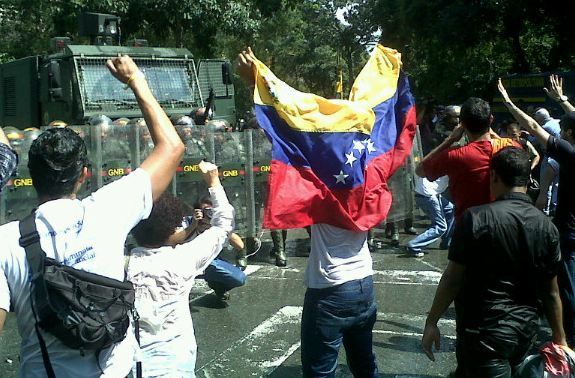 Original text 11:40 ET: A peaceful student demonstration in Caracas, against a new university law passed this morning, is being repressed with water cannons, armored cars, and military. Several students are injured, one seriously. An AP photographer is also among the injured according to Globovision, a regime-critical TV channel. Simultaneously reporters in western Venezuela, where the farmer’s rebellion started last week in protest to widespread confiscation of farms, report of a strong militarization of the area in Zulia state. A clash may be imminent between the military and farmers who are blocking the highways with their farm vehicles in protest to having had their land stolen. 2010-12-24: Here is a blog with video and images from the land confiscations in western Venezuela. In English. The situation has shifted several times since but it is still very dangerous. Finansierat av oljeinkomster driver Venezuelas president Hugo Chávez en vänsterpopulistik politik, med USA som yttre fiende, och med Kuba, Iran och Ryssland som axelmakter. Inrikespolitiskt är hans retorik den vanliga marxistiska, med hatiska utfall mot kapitalister och lantägare, och hans politik är att gradvis strypa yttrandefrihet, demokrati, mänskliga rättigheter, och att konfiskera tillgångar succesivt så att befolkningen inte provoceras att göra signifikant motstånd. Men denna gång kanske han gått för hårt och fort fram: Den snabbast stigande hashtagen på twitter i Venezuela var på morgonen “statskupp” (#GolpeEstadoVE), syftande på att Chávez genomför en de facto statskupp av samma slag som Adolf Hitler gjorde våren 1933. Sedan flera år har det pågått konfiskering av företag i Venezuela. I åtminstone ett år har konfiskeringarna också omfattat bondgårdar. De konfiskerade gårdarna har ofta lämnats i träda efter att boskapen slaktats. I fredags slog jordbruksverket, understödda av gendarmer och militär, till mot 47 bondgårdar söder om Maracaibosjön, i delstaten Zulia. Chávez kallar det expropriering, men alla vet att det är ren och skär konfiskation. I TV-tal påstår han att bönderna inte äger marken, att de inte brukar den, att de är slavdrivare, samt att förmännen i den trakten fortfarande har som tradition att ta oskulden från arbetarnas döttrar. Kanske det finns någon som tror honom, men de har nog inte tillgång till internet och twitter. Från av gårdarna, El Peonío, en mjölkgård med tiotusentals hektar mark, tusentals kor, hundratals anställda, och en 94-årig ägare vid namn Jesús Meleán, blev militären dock handgripligen utkastade. Detta blev startskottet för ett spontant bondeuppror. Vägar blockerades och budkaveln gick, med början i torsdags. Informationen spred sig som en löpeld på twitter, men i media var det tyst. Bondeorganisationer höll möten och beslutade sig för att gå i strid för alla de konfiskerade gårdarna. Andra grupper i delstatshuvudstaden Maracaibo höll ett stormöte i söndags och bildade Zulias Demokratifront, för att försvara lag och rätt mot staten. TV sände från dessa möten, men Chávez hejdukar såg till att blockera alla viktiga delar med meddelanden, typ Anslagstavlan. Detta drabbade till exempel delstatens guvernör, när han i sitt tal i hårda ordalag kritiserade Chávez politik. Tack var twitter, och andra sociala media på internet, spred sig dock budet om ett folkligt motstånd fort. Folk tog till gatorna, och på måndagsnatten genomfördes en kastrullbankning. Idén är samma som användes i Iran vid revolutionen mot shahen: att folk skall (anonymt) kunna avgöra hur pass starkt motståndet mot regimen egentligen är. I många städer stod folk till och med på gatan och bankade, i andra, mindre, orter var det ännu tyst. Internet har sina begränsningar i ett fattigt land. Själv har jag följt utvecklingen på twitter kontinuerligt sedan den 16 december, då hashtagen #SOSinternetVE blev den ledande i världen. I flera dagar stod den 94-årige Jesús Meleán som en symbol. Genom att säga till militärerna som kommit för att ta hans gård att det finge bli “över hans döda kropp” väckte han en moståndsanda hos de modlösa. Detta mod var på väg att förbytas i förtvivlan då Meleán gick med på att sälja gården (om än till ett hutlöst pris) till Chávez hejdukar i måndags. Uppgivenheten spreds på twitter, “alla har ett pris”. Det var naturligtvis Chávez avsikt; genom att kompromettera symbolen uppnådde han det han aldrig hade kunnat uppnå med att fängsla eller köra över honom. Men segern blev kortvarig. Fler och fler tweets började tala om att Meleán och hans gård var inte det striden handlade om. Då Chávez också erbjöd att återlämna 16 gårdar höll jordbruksrörelsen fast vid att samtliga 47 skulle återlämnas, annars fortsatte de stridsåtgärderna. Under tiden kom det nya uppgifter från kongressen om nya lagar som antogs dagligen med många inskränkningar av friheter och rättigheter. Den pågående upprorsandan omformades. Det började smyga sin in antydningar om att man måste gå längre än till bara protest. Under onsdagen började kvittrandet allt mer handla om regimskifte, att Chávez måste ut. På eftermiddagen släppte folk texter med uppmaning till civil olydnad och organisering, detaljerade planer, instruktioner, och beräkningar att det behövs 500.000 man för att få erforderlig effekt. Bland de rykten som florerat, och vars tillförlitlighet jag naturligtvis inte kan kontrollera, kan nämnas att bönderna vars gårdar konfiskerats identifierat 30 medlemmar av FARC bland statens utsända. FARC är en i Sverige terroriststämplad knarkgerilla som verkar i Colombia, men som har en fristad på den venezolanska sidan gränsen (där aktionerna skedde). Vidare nämndes i ett antal tweets att militärerna i aktionen stod under kubanskt befäl. Detta var, enligt kvittrarna, ett tecken på att venezolanska militären i stor utsträckning är ovillig att medverka i sådana omoraliska aktioner. Andra uppgifter förtäljer att en stor majoritet av landets militär skulle ställa sig på grundlagens sida mot Chávez om det kom till att välja. Det gäller dock inte den högste chefen för militären; han har klart sagt att han skulle inte acceptera att någon annan än Chávez blev president efter valet 2012. Det uppror som gror vilar på principer om icke-våld, på att följa grundlagens anda (men inte de grundlagsvidriga lagarna), och har som mål att återetablera demokratin och mänskliga rättigheter i Venezuela. Personligen tror jag dock inte att Hugo Chávez avgår frivilligt; jag tror att han kommer att säga om presidentpalatset som Jesús Meleán sa om sin gård: Över min döda kropp. Det faktum att hans agerande de senaste dagarna klassificerats som statskupp av både oppositionen och flera inflytelserika observatörer utomlands ändrar dock ekvationen. Det är inte längre någon risk att militären anklagas för statskupp om de avsätter honom; de riskerar inte den isolering som Honduras råkade ut för (där var det Chavez som varnade för en förestående militärkupp som ett sätt att förhindra den). Med tanke på detta skulle det inte förvåna mig om Chávez blir avsatt av militären inom de närmaste dagarna – men det krävs att omvärlden tydligt säger ifrån att Chávez genomför en statskupp. Är Carl Bildt beredd att tala klarspråk? Kan Du säga “Hugo Chávez genomför just nu en juridisk statskupp av samma slag som Adolf Hitler gjorde våren 1933”?